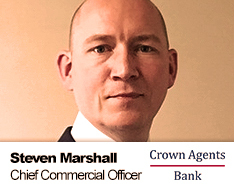 Steven Marshall is Crown Agents Bank’s Chief Commercial Officer and a member of the Executive Committee. He joined the Bank in October 2016 as the Head of Payments and Cash Management and was promoted in May 2017. Steven previously worked for the United Nations Migration Agency. He began his career on the Graduate Training Programme at Barclays where he held a number of positions in his 7 years with the Bank. He left in 2008 to join Standard Chartered where he was the Global Head of Public Sector and Development Organisations. He holds a B.Sc. in Medical Bio Chemistry from Glasgow University and a M.Sc. in Immuno-pharmacology from Strathclyde University.